This international conference is organized by the Department of History, Archaeology and Social Anthropology of the University of Thessaly. It comes as a concluding event of the graduate seminar on "Religion and Social Change" scheduled for the second semester of the academic year 2004-05. 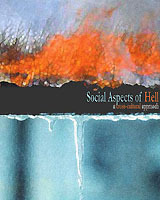 The purpose is to examine ways in which ideas and images about punishments (and rewards) after death or at the end of times interact with social organization and social behaviour in everyday life. It is hoped that contributors will be able to bring into the discussion information from various periods and various cultures, mainly, but not exclusively the Mediterranean. The conference will be held on 26 and 27 June 2005, at the Saratsi Amphitheatre, situated in the campus of the School of Humanities of the University of Thessaly, in Volos, Greece.